He's also doesn't pick Magic-User spells for you. 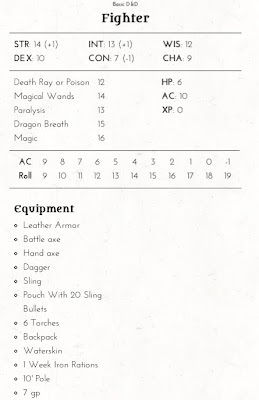 Another answer to those minor complaints is that this generator was largely designed for use in a ODD (Little Brown Book) based game of high anxiety that the author plays in where 1) HP are generated with a D6 at the start of each session (and 1HP happens) 2) There is no alignment 3) There is a random spell book rule (which is pretty cool - though so far all anyone's gotten is read magic), but it is indeed not included. Hilarious. Where was this discussion happening? Yeah, I was trying to churn out the mechanical stuff. I could pick random alignments and languages, but that seems like maybe it should be a player choice. It lists when you have bonus languages now. I'm going to add random spells next. Also there isn't a rule about re-rolling HP. You could just re-roll the character, anyway. Wad Luke Crane really complaining about a FREE generator that someone put out just because it would be cool? Quoth Luke after this blog post: "I think this is a fun tool. I'm being cheeky pointing out the things he missed. 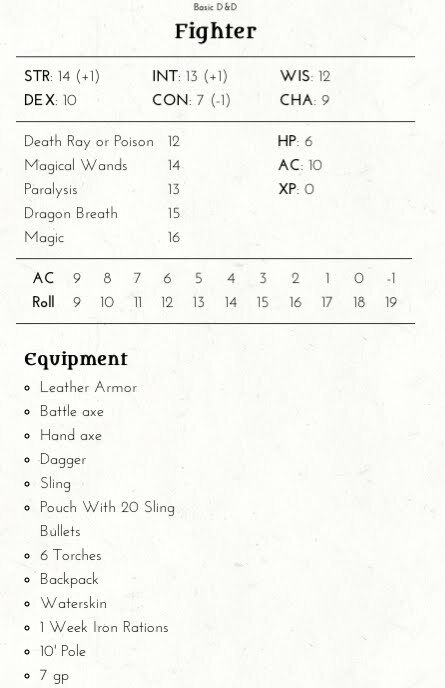 But if I were using it, I'd want a complete character so I could click and go.﻿"
I'm assuming 'Floating Disc', 'Magic Missile', 'Shield', 'Ventriloquism' were all added in Greyhawk?﻿"